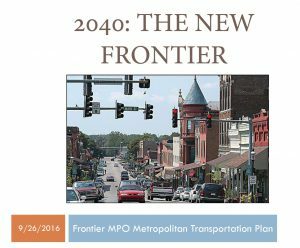 2040: The New Frontier is the regional transportation plan for the Fort Smith Region which encompasses municipalities and unincorporated portions of counties in Arkansas and Oklahoma. It is a plan that identifies the needs and financial resources available to meet the area’s transportation needs over a twenty-five year period. This Plan was developed through a cooperative effort coordinated by the Frontier Metropolitan Planning Organization (MPO), and its member jurisdictions, Fort Smith Transit and other transit providers, the Arkansas State Highway and Transportation Department (AHTD) and the Oklahoma Department of Transportation (ODOT). The metropolitan transportation planning process is required to be a cooperative, continuing and comprehensive multimodal process that monitors regional growth and any subsequent socio-economic changes resulting from growth. The monitoring efforts of the Frontier MPO transportation planning process are conducted in cooperation with local member governments in order to maintain an accurate and current representation of street and highway improvement needs.